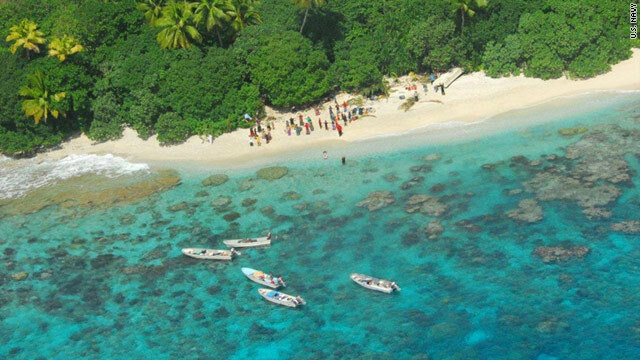 Fifteen people, missing since Tuesday, were spotted on a small island in the Pacific Ocean. 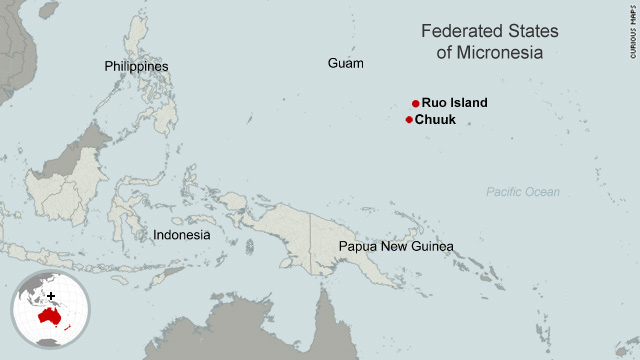 (CNN) -- Fifteen castaways marooned on an uninhabited island that's but a small dot in the Pacific Ocean are believed to be safe and in good health, a U.S. Coast Guard official said Saturday. Missing since Tuesday, after their small boat hit a coral reef and overturned, the six children and nine adults were finally spotted. The Coast Guard, which searched 18,642 miles over a period of 76 hours, is sending people to check on the castaways, who are from Chuuk, a group of islands in the Federated States of Micronesia. "I think they're very safe," said U.S. Coast Guard Search and Rescue Specialist Lee Putnam. "We want to know the story, but at this point it's not a rescue mission." The 15 people -- between the ages of 4 and 59 -- were heading from Chuuk to Ruo Island for an outing for the children. Their skiff's hull was damaged when they hit the coral reef, said U.S. Coast Guard spokesman Ensign Richard Russell. They dragged the 28-foot boat to the beach and waited. Their only link to the outside world was a solar-powered radio. A long-range Navy search plane flew over the area after the Coast Guard received a report of the missing skiff from another vessel in the area. "Once on scene, the aircraft reported back that a damaged vessel was overturned on the beach and several crude shelters had been erected on the beach," a Coast Guard statement said. "Three other boats could be seen on the island and people on the shore began waving at the plane as it soared overhead." An aerial image released by the U.S Navy showed five small boats near the island, known as Fanano, and many people on shore. The other boats are thought to belong to area island residents, Putnam said. "It's not determined yet whether they want to leave. Remember their original destination was Ruo," he said, in response to whether the Coast Guard planned to take the castaways home. Many may already be on Ruo Island, said Putnam. The Chuuk State Department of Transportation reported the boat missing to the Coast Guard on Tuesday morning when it was overdue at Ruo Island. The national government of the Micronesian Federation, the Chuuk state government and the Guam sector of the Coast Guard coordinated a joint search to find the boat. The Federated States of Micronesia is a democratic island group in the Pacific Ocean between Hawaii and Indonesia. Independent since 1986, the vast archipelago of hundreds of tiny islands comprises a land mass of just 702 square kilometers, about the size of Singapore. It includes the Chuuk Islands, Yap Islands, Kosrae and Pohnpei. CNN's Moni Basu, Dana Ford and Molly Green contributed to this report.